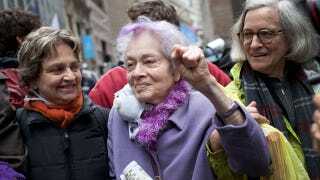 Frances Goldin is an 87-year-old literary agent and activist with a bold streak of purple in her otherwise grey hair. She's joined the Occupy Wall Street movement and has been protesting in Zuccotti Park, but she's not new to activism. She's been demonstrating in support of various social justice causes for decades and has been arrested for civil disobedience a whopping nine times! Her goal is to be arrested 12 times, but much to her dismay she wasn't able to come any closer to reaching it during the Occupy Wall Street march on Thursday. I was sure I'd be arrested today, but the cops were determined because of the bad publicity for them, to not arrest an 87-year-old woman. I said [to an officer], "What if I socked you in the eye?," and he said, "I'd give you a free shot." "'Well, what if I kneed you in the groin?," and he said, "No, you're not going to get arrested!'" It's probably for the best that she didn't go after any of the cops in the end. But let's hope she keeps up the good fight!